A tale of racial profiling, gentrification, fear, and trauma told partly in verse, Blindspotting was one of 2018’s best films — it’s a shame it flew under the radar on this side of the pond. After a short and successful festival run, the film was released exclusively in the United States to critical acclaim and award success. I can say that this praise is deserved; my eyes were glued to the screen for its 95-minute runtime as I was immersed in the world of Oakland as seen through the eyes of a convicted felon on probation and his wild best friend. Oakland-born rapper Daveed Diggs of hip hop group clipping. 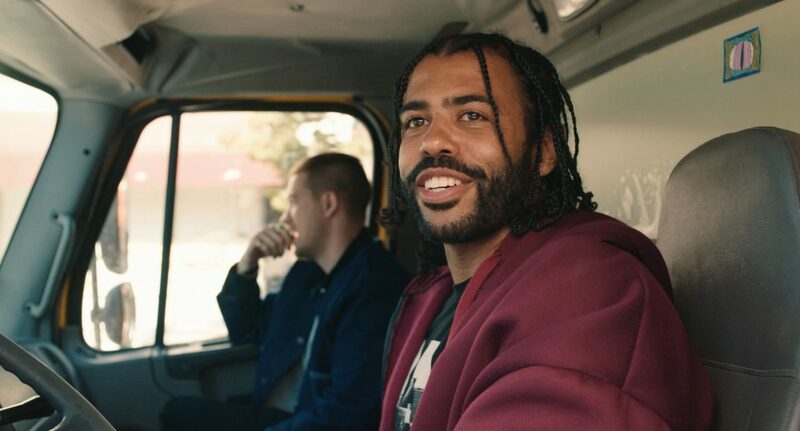 and Hamilton fame joined forces with poet-come-rapper Rafael Casal to write and star in Blindspotting. The clever tongue-in-cheek dialogue is brought to life with the help of music video director Carlos López Estrada whose previous directorial experience results in the film being visually captivating. Fast cuts, shots that seamlessly flow into one another, and a hefty sprinkling of visual comedy are the faces used to present issues of racial profiling and gentrification in Oakland, California. In Collin’s (Diggs) three final days on probation, he witnesses a murder: a white cop guns down an unarmed black man in the middle of the street. This scene haunts him for the remainder of the film as he treads lightly on the line between the legality and criminality of his hood lifestyle. During this time we’re presented with a vivid image of current-day America, strangely feeling like a caricature and a portrait, all at once. Hip hop plays a key role in the film in many ways. It’s a storytelling medium, with Collin and his best friend Miles (Casal) freestyling acapella as they go about their day or when they monologue in verse. These rhythmic recitals are refreshing and original despite being one of the oldest forms of storytelling used in anglophone culture (Shakespearean sonnets, anyone?). The rap-influenced soundtrack was custom-made by the two rapping screenwriters, featuring their vocals mixed over punchy beats. The soundtrack is available to purchase and stream as two EP’s — which will remain in my musical rotation for weeks to come. Visually, Blindspotting is stunning. It’s colourful, it’s clean, and it’s hypnotising. Some visual motifs are accompanied by audio cues, particularly those of police cars and a car alarm from the aforementioned crime scene, to transmit the overwhelming feeling of panic felt by the traumatised Collin. Other visually pleasing elements range from symmetry to punchy close-ups and are a clear sign of López Estrada’s history as a music video director. Blindspotting is a humorous portrayal of the current sinister state of racial tensions in America. The tactful yet brutal storytelling shows pure genius, and I cannot wait to see what Diggs and Casal write next. For now, however, I implore you to stream or pick up this film when it releases in the UK next month. It’s one of the best films of 2018 and it’s not just worth watching, it’s worth buying, keeping, and treasuring to revisit over and over and over. Blindspotting will be available on DVD, Blu Ray and digital download on 4th February.